Winner of the inaugural Max Ritvo Poetry Prize, North American Stadiums is an assured debut collection about grace--the places we search for it, and the disjunction between what we seek and where we arrive. "You were supposed to find God here / the signs said." In these poems, hinterlands demand our close attention; overlooked places of industry become sites for pilgrimage; and history large and small--of a city, of a family, of a shirt--is unearthed. Here is a factory emptying for the day, a snowy road just past border patrol, a baseball game at dusk. Mile signs point us toward Pittsburgh, Syracuse, Salt Lake City, Chicago. And god is not the God expected, but the still moment amid movement: a field "lit like the heart / of the night," black stars stitched to the yellow sweatshirts of men in a crowd. 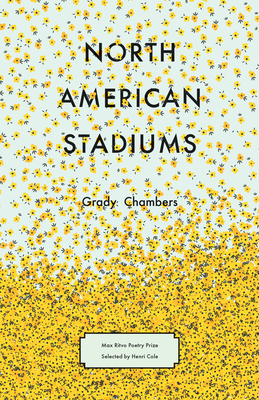 A map "bleached / pale by time and weather," North American Stadiums is a collection at once resolutely unsentimental yet deeply tender, illuminating the historical forces that shape the places we inhabit and how those places, in turn, shape us. Grady Chambers was born and raised in Chicago. He was a Wallace Stegner Fellow at Stanford University, attended the MFA program at Syracuse University, and has received fellowships from the Norman Mailer Center and the New York State Summer Writers Institute. His writing has appeared in Adroit Journal; Diode Poetry Journal; Forklift, Ohio; Nashville Review; Ninth Letter; New Ohio Review; and elsewhere. He lives in Philadelphia.